Is your SMT/trustees page inspiring? 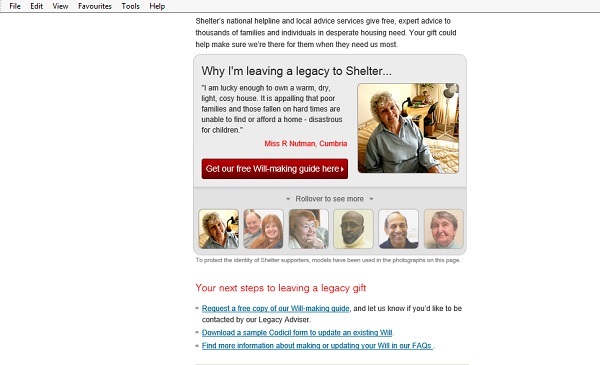 How to give the web pages about your senior managers and trustees a digital facelift. 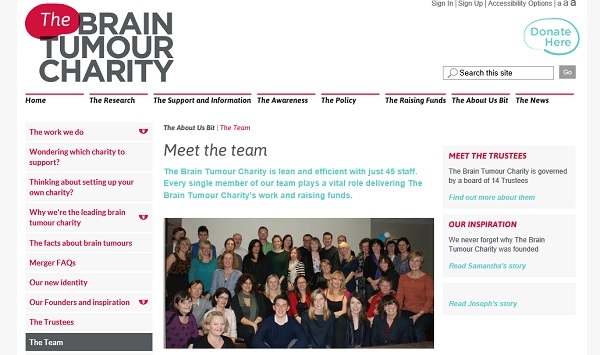 Most charities have a page introducing their senior managers and trustees. These pages are mostly dull and uninspiring. But they could be so much better. With a few tweaks, they could help to boost transparency and trust. They could be inspiring; bringing the passion your team has for the cause, to life. A standard ‘meet the team’ page has a photo and biography information for the CEO and other senior managers. 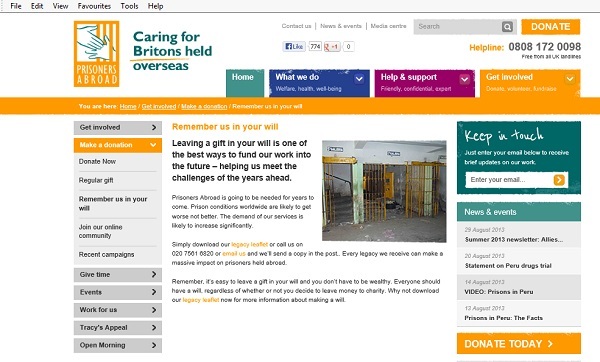 There may be a separate page for trustees using a similar style. These sit, reasonably buried in the ‘About us’ section, often in a subsection called ‘How we are run’ or ‘Our people’. On the face of it, it might feel like these are must-have pages which don’t need much content investment in them. They probably don’t get a lot of traffic other than from journalists or people looking for jobs / trustee roles. They are usually very functional pages which accidentally help to highlight the lack of diversity in the organisation’s management. Because they don’t get much attention, they don’t give any insight into the cause, or an understanding what and why these people do. The pages are very static, not doing much to sell your organisation. They are a website dead-end. But actually these pages are important. Done right, they make organisations feel more personal. They help with transparency. Here are some suggestions for how these pages could be improved to drive a deeper insight or conversation. Zoe Amar and Matt Collins have been on a mission to get CEOs tweeting since 2013. They produce tips and examples as well as an annual list of the top 30 Charity CEO tweeters. Many senior managers do embrace social media as a way of sharing successes, challenges as well as learning from and connecting with others. But many ‘our people’ pages still don’t include these links. Few promote the CEO’s Twitter address (including most of the winners of Social CEOs). And even fewer, include their blog or LinkedIn profile. Links for the senior team are not included either. What does this convey about the digital culture of the staff and wider organisation? If your senior managers are representing the organisation on social channels, this page should help people to connect with them. Organisations which do promote their team’s individual Twitter addresses are few and far between. Out of the 50 or so charities I looked at, I only found Breast Cancer Care, Islamic Relief, Diabetes UK, The Scout Association and Parkinson’s UK who were doing this. A few organisations were going further and including multiple channels. For example, SCVO’s full staff list includes contact details, individual listings include blog posts, NCVO’s who’s who pages links to blog posts, Twitter and LinkedIn, as does the people page for JRF. 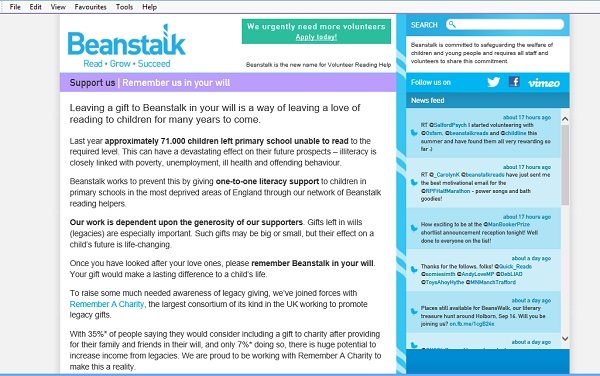 Do your trustees tweet about your charity and the work they do to support it? If so shouldn’t this information be included in their biogs too? Show current and future digitally-savvy trustees that you want them to use social media in their role. Even if just one of two of your trustees use social media or are happy for this information to be shared, add this to your page. There aren’t many organisations who are doing this. For example Clive Gardiner of NSPCC is the only CharityComms trustee who has his Twitter and LinkedIn links included in his biog. Small Charities Coalition have added buttons to the profiles of their trustees who are on Twitter. NAVCA have Twitter links for their trustees alongside their short biogs. NB While thinking about transparency and contactability, what is your organisation’s policy on publishing the email addresses for senior managers or trustees? How contactable are they? Contact information for trustees is especially rare to see. Take a look at Crisis who include the social contacts and email addresses for those who have them and Trussell Trust who have email links for all their senior team. Cutting and pasting detailed information from someone’s CV just isn’t interesting or engaging, especially when it is replicated in a long list of trustees. Of course senior managers and trustees have impressive backgrounds and experience but supporters may also want to know about motivations, personal experience and skills. Equally, including information about someone’s CAMRA membership or love of ballroom dancing may not be appropriate. write in the first person (I did this) rather than the third person (Janet did this) which is much more engaging – see Oxfam’s senior managers and Epilepsy Action’s trustees. Brathay Trust’s people page is really nicely written. keep it short and simple like this example from Lymphoma Action. You could illustrate your team in a completely different way. 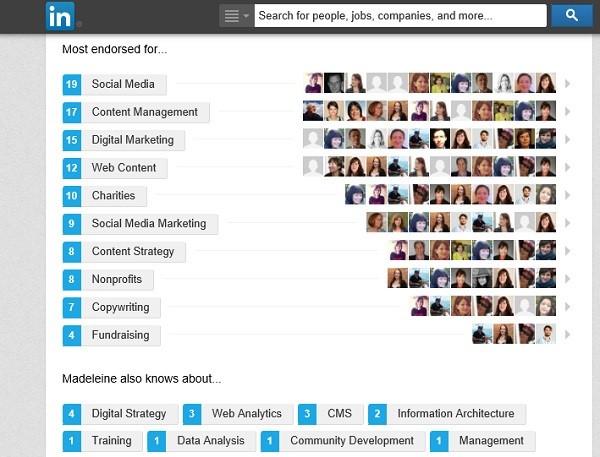 How about a skills profile for the team (think LinkedIn endorsements)? See more about writing great staff biogs in this nonprofithub post. Rather than head shots can you show your team in action? For example trustees from Blue Cross are pictured with their animals. Youth Music have roll-over images where the second picture shows each member of the team making music when they were younger. If you can’t use photos for whatever reason, try something more creative. 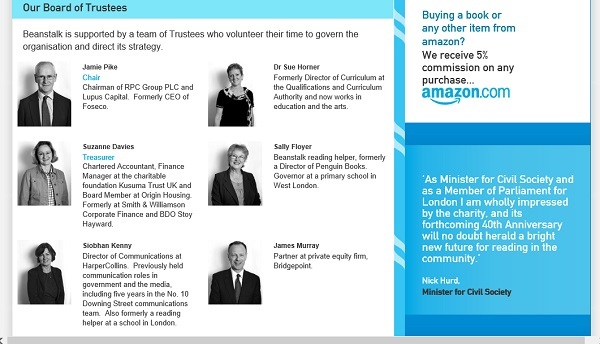 For example NSPCC use brightly coloured blocks for their trustees. Like with any page on your website, you should think about who is reading this page. Who is it for? What do you want them to do as a result (donate / feel sure that the charity is in safe hands / apply to become a trustee / want to know more)? It may be that all this biography information is not relevant, reading the detail of someone’s career can be quite alienating. Keeping it simple might be the best answer. Try limiting each person to one paragraph or a certain number of words. Or just including their role and a brief summary. Beanstalk shown here in 2013 do a mixture of both which is really clear. You could also think about doing more to showcase the people in your organisation who are doing frontline work. Their stories may be more engaging than the CVs of senior staff. Stop being so hierarchical. Take a look at this series of videos from Macmillan in which we meet nurses, helpline staff and therapists. Breast Cancer Now do this well too. British Lung Foundation do a really nice job of using their people profiles to link to more information about key areas of their work. Test what works best for your audience by looking at your page statistics. Make some changes and see how it influences traffic and bounce rates. Change it back or do something different if it has a negative effect. You could also try putting a call to action (donate / sign up to newsletter etc) at the bottom of the page and see whether anyone acts. 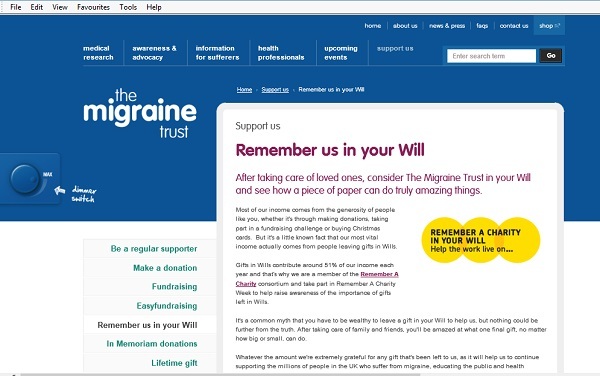 Do you have a page for SMT / trustees / ‘our people’? Do the photos / video look professional and help to make people feel approachable? Is your text interesting and appropriate? It should bring the work your people do to life. Be aware of word count and usability – realistically who is going to click on a page of names and through and read each one? What do your stats show about traffic to these pages? Are bounce rates low? What can you do to improve click-on’s and make them more interesting? Brathay Trust’s people – chatty, warm statements from the team. The internal politics and processes connected with tweaking these pages is not necessarily simple. Can you show senior managers these examples to help convince them that it is time for a digital facelift. The profiles of the brilliant people who work of volunteer for you should do them justice. Show that you are a digitally confident organisation and that your people naturally use digital channels to connect, share and learn. This could help to attract more digitally skilled staff and trustees to apply for future roles. See more from Reach Volunteering about how to attract and recruit digital trustees. How do you make your staff pages useful? What difference has improving your staff pages made? Do you have reasons for not including social contact details? Please share good and bad examples you have seen. 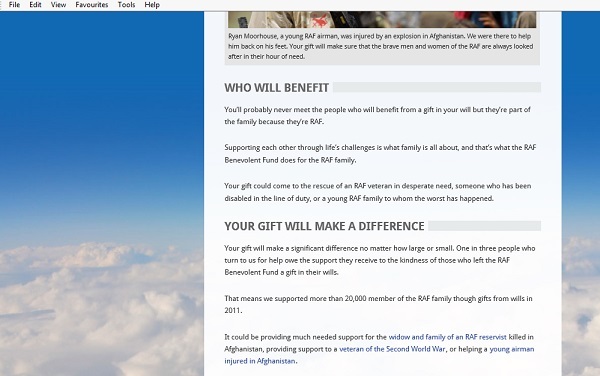 Am especially keen to find examples from small charities. Please share – go-on, add a comment! Please also get in touch if you’d like me to help you improve your staff pages.